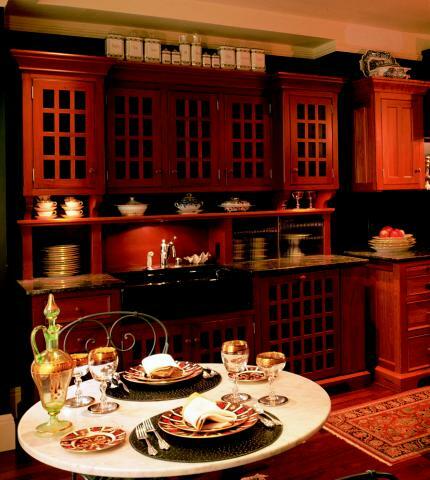 This formal kitchen in one of San Francisco’s oldest buildings on Knob Hill, features 7 of our Workstations, two are shown above. 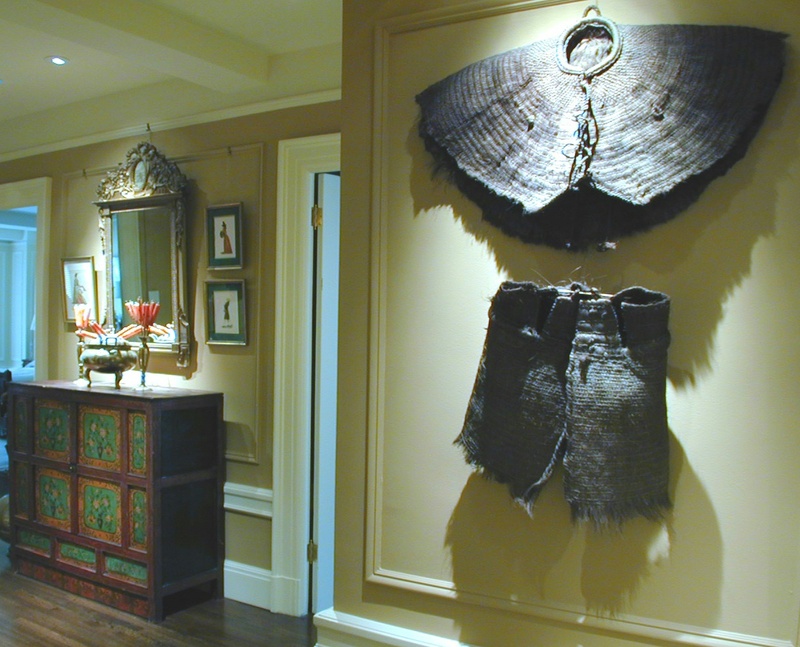 The owner had already placed altered antique furniture in her bathrooms instead of vanities and even her bookcases in the library were separate pieces with glass doors. 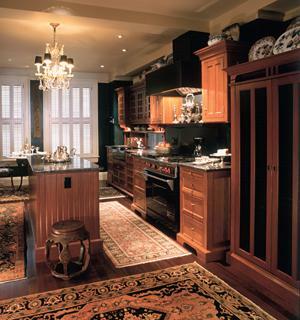 So having the kitchen and butler;s pantry furnished with our workstations was a natural fit. In addition, the uneven walls and ceilings made it an ideal opportunity to use unfitted workstations instead of installing continuous cabinetry. 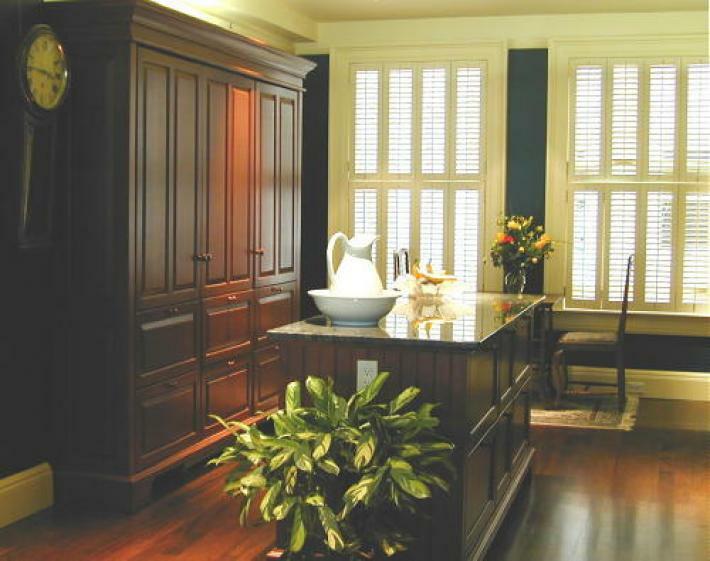 The Hampton’s Mahogany armoire (above) is a Subzero/Pantry unit (SZ) in the largest size we make. This one features two Subzero 700 series tall units, one a refrigerator and the other a freezer. Separating them is a pantry with roll-out trays in the upper section and drawers below. This pantry combination accommodates all of this family’s food storage needs, except for a small under-counter Subzero 700 refrigerator that is located in the island unit (SZ-Base unit). The freestanding island also features other drawers for abundant storage, and the Copper Swirl granite top is great for food preparation as well as landing space when loading or unloading the pantry. The cooking workstations consist of a pair of small B18 and TP18 units flanking a stainless steel range and hood, and a DO40-OM Pie Safe that safely conceals an extra oven and microwave. One of our largest Sink Workstations features a black Kohler apron front sink, counter tops at two working levels, grid style doors and an integrated dishwasher. Plates are enclosed with our ribbed sliding glass doors. Above is a scene from the entrance hallway, just to show how the rest of the home is decorated. Obviously, or workstations have found a good home! 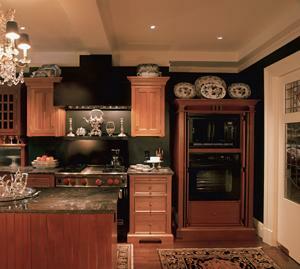 Please click on the following link for more information about this Knob Hill Kitchen.